Irma is now considered a Category 2 hurricane with sustained winds of 100mph, with the eye of the storm passing over Naples. The storm is still en route to Tampa. According to Miami-Dade County School Superintendent Alberto Carvalho, all public schools in the county will remain closed until further notice. Downtown Miami is experiencing flooding from the storm's surge, with the water waist-deep in some areas. President Trump approved a request from the state of Florida for a disaster declaration. The decision will make federal funding available in nine counties, which will help supplement local and statewide recovery efforts. More than 2.3 million are without power in Florida as Hurricane Irma continues traveling across the state. Irma has been downgraded to a Category 3 storm with sustained winds of 120mph. The eye of the storm has traveled to Naples, with CNN reporting that the "visibility is almost gone," with the weather changing intensely in a matter of 15 minutes as the storm arrived. A flash flood emergency warning has been issued for Marco Island, Naples and other regions in southwest Florida. Two construction cranes crashed in Miami, with the cranes being a major area of concern because city officials did not have time to take them down. The eyewall of the storm is reported to arrive in Tampa around 11PM. More than 1.69 million residents are without power in Florida, as of 2:230PM ET. As of Sunday afternoon, Irma has broken several records. Per CNN's meteorology team, Hurricane Irma is the strongest Atlantic basin hurricane ever recorded outside of the Gulf of Mexico and the Caribbean sea, as well as spent three days as a Category 5 hurricane, marking the longest storm to remain at that level of intensity since satellite storm-tracking began. Additionally, no other recorded storm has maintained winds higher than 185 mph for as long as Irma has. The storm also marks the largest evacuation in the history of the Bahamas, and possibly the United States.Hurricane Irma officially made landfall over the Florida Keys, arriving at Cudjoe Key, Florida on Sunday morning (Sept. 10) as a Category 4 storm. According to the National Hurricane Center, the storm is hurling sustained winds of 130 mph. "This is a life-threatening situation," the National Hurricane Center stated early Sunday. "Near the coast, the surge will be accompanied by large and destructive waves." Essentially the entire state of Florida is under a hurricane warning, with at least 36 million people advised to take heed. The storm is expected to move up Florida's western coast, with Naples, Fort Myers and Tampa all anticipating to experience the worst of Irma's wrath. 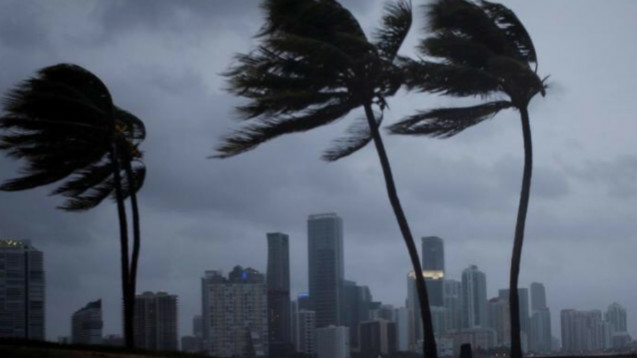 Officials are warning residents of life threatening winds and storm surges, with Miami-Dade PD urging residents to stay indoors at all costs. As of 9:54 AM ET, the Miami-Dade police department is no longer responding to calls for service, with officers sheltered for their safely. More than 1.3M people across south and central Florida are without power as of 10:30 AM ET, Sunday. Prior to the storm making landfall, an estimated 6.3 million people were ordered to evacuate. According to the governor's office, more than 720,000 people have moved into more than 390 shelters across the state. Additionally, at least 24 people have died as a result of Hurricane Irma across the Caribbean with Florida's death toll currently at three.